Healing Gemstone Bracelets – Do You Wear Them? 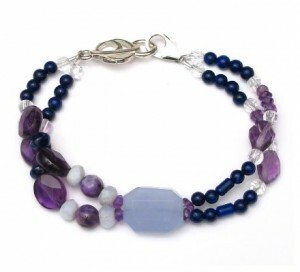 Feb. 27 Cancer Help, Healing Gemstone Jewelry Comments Off on Healing Gemstone Bracelets – Do You Wear Them? Some people love to wear jewelry. It brightens their day, adds a personal touch to their persona and delivers a touch of glamor to an outfit. For some their style tends towards earrings. Others, towards pendants or bracelets. Personally, I wear earrings more as I teach dance classes. I don’t want my jewelry to get in the way. But when I go out socially, I love to put on a special pendant or wear one a bracelet made with beautiful gemstones. The healing gemstones add an extra element of energy and specialness to the occasion. During cancer treatment, when I didn’t have hair and was working at putting a good face on the situation, I wore big earrings with my scarves. I would admire the beautiful healing gemstone jewelry I’d see and eventually I added pieces to my jewelry collection. Each of them brings an element of their special energy to my being. And some have come as very gifts bearing love and caring – in fact, a couple are healing gemstone bracelets. ← Does Cancer Treatment Change Your Skin?